Is a Montana landowner’s push to graze domestic animals dangerous to bighorn sheep? Wyoming Game and Fish Department will increase the cost of license fees, application fees and preference point fees in 2018. The increase in fees is a result of the Wyoming Legislature voting to reduce the Wyoming Game and Fish Department's budget by six million dollars in 2018 and to maintain funding for fish and wildlife at current levels. The biggest changes for 2018 are for bison, moose, and increases in cost for elk, antelope and deer Special draw permits. Nonresident tags for mountain goat and bighorn sheep increased slightly, as did the Regular draw tags for elk, deer, and antelope. I'll briefly cover these changes below. Since application season is here, for a detailed breakdown of Wyoming elk, draw odds, and other statistics you can check out the recently published Application Strategy article here. Nonresident bison increased from $2,522 to $4,417, while nonresident cow/calf tags went from $1,000 to $2,767. Wyoming’s price increase could be considered dramatic when compared with neighboring Montana’s $1,250 bison tag. On the other hand, South Dakota charges $6,006 to hunt trophy bison in Custer State Park, while Arizona gets $5,400 plus the hunting license fee, and Utah charges $2,615 to hunt bulls on Antelope Island, and $1,518 to hunt them in the rest of the state. Nonresident Shiras moose tags increased from $1,430 to $1,997. Montana charges $1,250 and Idaho gets $2,101 plus a $154.75 nonresident hunting license. The biggest change for this year for nonresidents interested in hunting elk is the increase in the special license from $1,085 to $1,335. The standard elk license also increased from $605 to $707. This change is enough that I think most nonresidents considering entering the Special draw will bank their points for another two or three years and apply for the Regular draw elk tag. Though this strategy may not pay off in the long run. The only state that has a more expensive elk tag is the Utah multi-season limited entry at $1,505. 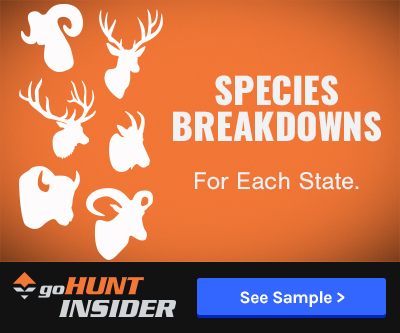 Nonresident Special draw deer licenses increased by 17% from $580 to $677 in 2018. Regular draw deer licenses increased slightly from $340 to $389. 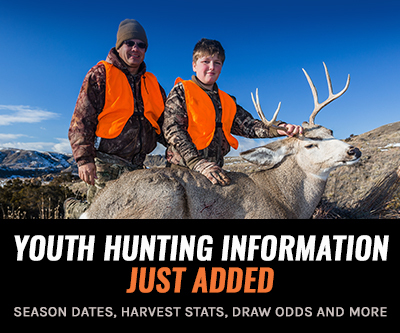 Youth nonresident deer licenses did not have an increase. Antelope nonresident Special draw licenses increased from $540 to $629. Regular draw antelope licenses increased from $300 to $341. Like nonresident youth deer, the nonresident youth antelope did not see an increase. There will be other smaller increases in Wyoming. Bighorn sheep licenses went up to $2,335, an increase of $69. Nonresident annual fishing went up to $102. Nonresident black bear increased to $373. Gray Wolf permits went up by $7 to $187. Nonresident mountain goat tags increased to $2,177. Resident licenses saw increases by $5 per species or license type. 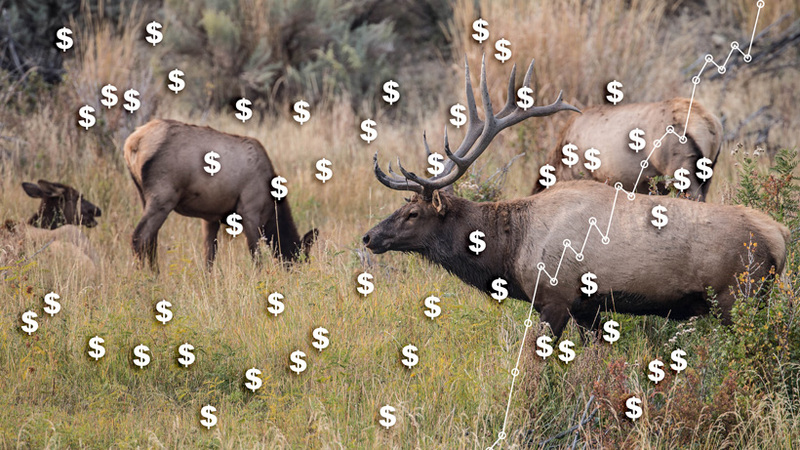 The big surprises for these 2018 license fee increases are that bighorn sheep only had a small raise, while moose and bison had huge increases in price as well as a large spike in Special draw elk license price. Now that Wyoming’s bison prices are almost as high as Arizona and neighboring South Dakota, I think a lot of people will be priced out of the draw, and it may increase the odds of drawing a bison tag. The increase in the price of moose and Special draw elk will probably lead to more people just buying points. Only time will tell if applications trends continue to climb or if hunters look elsewhere. Each appointed commissioner can issue a determined number of deer, elk, and antelope to nonprofit charitable organizations that can auction or raffle those off. I have included a link below where you can find the 2018 commissioner license information. WY also has a super tag program where they offer a license for each species and one package that includes 3 species of your choice. The are $10 each for the individual species and $30 for the 3 species package. More info can be found at the second link below. Hope that helps! Does anyone have any information about the "Commissioner's Tags"? I heard from a buddy about these tags and it sounds like there are non-profits that are given a certain number of tags and you can make a donation to be entered into a lottery style pick for these tags? Are these the Super Tags that you refer to in the Wyoming state regs? @Marshal - The $1,335 takes into account the $15 application fee, $692 license fee, $576 special fee, and $52 preference point fee. The $52 preference point fee was used as most people have been buying preference points for years, so this goes into effect when sort of determining what your application would cost. Oh and one other kicker they neglect to tell you that really affects your hunt. Once they start feeding elk on the National Elk Refuge, they contact you and from there you have 48 hours to try and harvest your Bison, if they are even on the refuge. Hopefully the weather changes soon and NW Wyoming gets some serious snow, otherwise I think the Game and Fish will have a lot of angry Bison hunters knocking on the door. Wow, that is a crazy increase for Bison hunting. I have a cow/calf tag this year and since it has been so mild in NW Wyoming the Bison are sticking to the National Park and not one, yes not one, cow/calf has been taken so far this year. According to the Game and Fish, they will close the season on Jan. 31 regardless of the harvest. Thank god I did not draw this tag next year. It is hard enough to potentially swallow a $1000 tag with a pretty good chance of not harvesting an animal let alone paying double that. I have taken three separate trips down to the area to scout and it is definitely true that they only migrate from the National Park to the refuge and very few wander into the National Forest where you can hunt them. Only 18 bulls have been taken to date. That is not a good harvest number when you pay that kind of money and realistically don't even get an opportunity to hunt them. You can take pictures along the highway but that is not the same as trying to actually hunt them. I don't have a problem paying $1000 for an elk tag and not being successful if I actually get to hunt them and have a solid hunting experience which is worth the money. However, the Bison hunt is absolutely dependent on weather and could be a massive waste of money and especially hard to swallow at a cost of $4000+. I am pretty disappointed in the whole Bison tag experience. Wyoming Game and Fish does a terrible job explaining the hunt to people as it is fully dependent on weather. Unfortunately, weather has not cooperated and I guess that is hunting. The WGFD website has the special Elk price listed at $1283 not $1335. Seth is spot on. Take bison and look at harvest rates. Has dipped under 50% once in the past decade while usually from 70% to above 90% other years. That is not 90% of tags but of active hunters. A few hunters only grasp after drawing that bison may stay in the park for weeks at a time. Some years hunters averages over 10 days to harvest. The Reservation Hunt is likely a certain deal in a day or two in the field. Is one thing to get skunked because the critters are there but you did not find a shooter. Another thing to be in a place with zero legal bison for weeks. 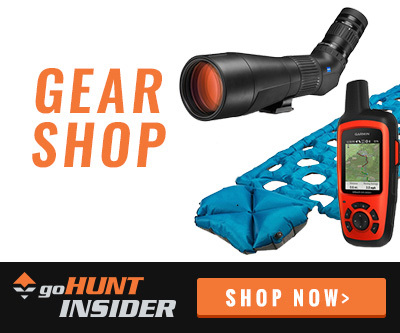 Hard to plan a hunting trip in that case so buyer beware. Arizona has similar challenges on their park boundary hunt. Better moose values to be had. WY moose tag cost plus an expected 45 years to draw if are under 5 points today at $150 a year makes the decision to head north easy. Goat is low odds/low annual application cost so like buying a Powerball ticket. If want a big goat or great hair, go north, though. As I am overseas, I am just buying points this year in all states. So while I want to cry at the thought of $1300 elk tags, maybe I'll have enough points that I can get into a premium unit upon my return. The two most important changes are that I had considering using my moose points on a cow tag. The $1997 fee for a moose tag, makes that a hard to swallow that option, considering I can hunt moose in Alberta guided for under $6000. My last research about a week ago showed 14 non-resident bull bison tags for 2017. They are now about 60% of the price of guided Indian Reservation hunts in Montana at $4417. These are a truly free range-bison in God's country, I honestly think they could get $6500 or more for them, and I am sure the future will only bring more expensive things from Wyoming tag increases. Wyoming sheep tags at $2335 are still a bargain. I don't think they could really cap the price, New Mexico gets over $4000. I think non-resident sheep tags could be $10,000 and we will see that one day. Guided Indian Reservation and Canadian bighorn sheep hunts that include tags sell for over $25,000 and many times over $50,000. Sheep just don't have a price cap. So any sheep tag you get for less than money is a good value. Mountain Goats are on the other end of the fence. There is so much opportunity in British Columbia, Yukon Territory, North West Territories and Alaska to hunt bigger goats, with more hair. Guided Canada and Alaska mountain goat hunt prices are often cheaper than good mule deer hunts through out the west. Something to consider when applying for mountain goats as a non-resident and using money that should be spent on sheep tags.